Today's article on Tree Hugger jumps on a ridiculous bike helmet ad by the American Auto Association (always good for botching bicycle safety). "...So on a construction site one makes sure that there are safe routes, protection from dangerous equipment, picking up the crap and keeping everything in good order, and lots of fencing to keep people who are not construction workers away from those who are. 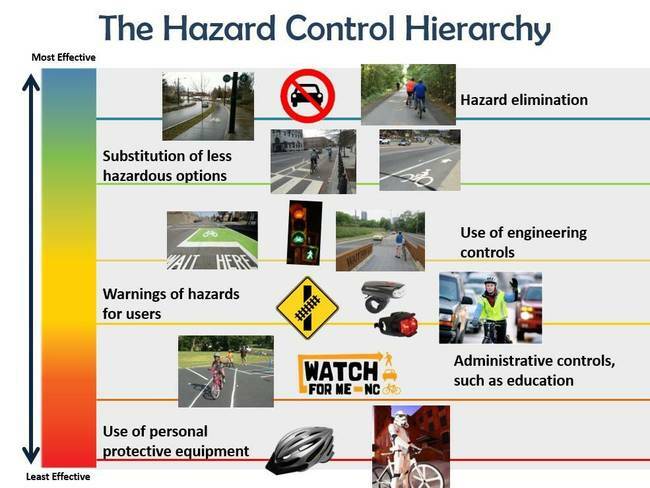 Then there is education and training of the workers, strong enforcement of the rules, and good maintenance of the tools..."
But whenever I read an article about bicycle helmets, even if it starts off showing how ineffective helmets are, I wait until the end to rejoice. For some sick reason, authors of articles that expose the truth about bike helmets, tend to wrap them up with a guilt-ridden paragraph or two stating their ingrained opinion that cyclists still should wear a helmet no matter what the facts show. "...If the American Automobile Association was really concerned about cyclist safety, it would be telling its members to slow down; it would be supporting the installation of bike lanes even though they might lose a driving lane here and there; they would work to get people out of giant pickup trucks and SUVs with big flat fronts that are disproportionately deadly, and they would support Vision Zero campaigns. But instead we have this." Read the article and enjoy!